The film has its roots extending into the German Expressionist movement, which is generally considered to have lasted from 1914-1924. It was released during the first year of the Academy Awards and was nominated for four, only winning three including the prestigious Best Unique and Artistic Picture Award, a qualified Best Picture award that was discontinued after the first Academy Awards. The film lost to Wings (1927) for Best Production, now called Best Picture. It stars George O’Brien as The Man and Janet Gaynor as The Wife. This beautiful impressionistic film opens with an unnamed Man and his Wife whose marriage has grown stale with age. The setting is an early 20th century European village, located in a farming town far away from the city (the set was actually filmed in Lake Arrowhead, California). Vacationers from the city visit the country to get away during the summer. One vacationer in particular is identified as the “Vamp” who is having an affair withthe Man. They sneak away in the night to kiss near the lake under the moonlight. She begs him to move to the city where the flappers and jazz music are now en vogue. He is tempted but is reminded of his wife and child. The Vamp then devises a plot for him to murder his wife by taking out a boat and drowning her -making it appear as an accident. The plan involves the Man pushing her into the water and then taking some reeds to make it seem as if he only barely escapes his boat as it is capsizing. The Man then begins to act as a madman (Murnau had him wear weights in his shoes to create the ‘Frankenstein’ image, also echoing his earlier horror film entitled Nosferatu). The next day he takes his wife out on the rowboat into the lake and attempts to attack her, lunging at her, but he cannot muster the strength within himself to do it. She is frightened and he rows them to the other side of the lake where she runs away to a tram that takes them both to the city. She does not forgive him for the attack. As outsiders, they go to a café where he again makes an attempt at reconciliation, but she is still in fright. They exit the café together and come upon a wedding happening at a church. Together they sit inside the church and bear witness to the pastor stating “keep and protect her from all harm” to the groom. This causes the Man to break down and beg for forgiveness from his Wife. They then embrace and leave the church weaving through traffic as if in a dream-like state. They wander into a barbershop where the Man gets a trim and shave and defends his Wife from another man’s advances. The couple continues to a photographer where they get a photo taken of the two of them kissing. As the photographer is preparing the picture in the dark room, he accidentally knocks a Greek statue that has no head or arms. Thinking that he broke the statue, the two take their photograph and flee, while the photographer is left smiling at their misperception. Then, they enter a carnival where they play games and go dancing all throughout the night. Happy and in love, they enter their idyllic boat to sail home, away from the city. Suddenly, a tempest erupts and he ties the reeds to her body so she can float home, in an attempt to save her. However, he later washes up on the shore and can’t find her. After the storm clears, he gathers people near the water to send out a search party in the water for her. When they do not find his Wife, the Man returns home to find his beau, the Vamp, waiting for him. She thinks the plan has been accomplished, but he tries to strangle her –a hedonistic woman from the city – for tempting him and destroying his marriage. At the last minute, his Wife is found and they embrace as she wakes from her near deathbed and the sun rises. F.W. Murnau hated using title cards in his films. As the film progresses, they become less and less frequent. This was Fox’s first film to be made with a recorded score and it was the first and only film to be awarded the Best Picture category for Artistic Quality or Production, before the category was removed. Many of the cinematic superimpositions were created in the camera as one image would be filmed blocking out the rest. Then they would put the exposed film back into the camera and film the remainder of the scene. Overall, the film was a box office flop because it was released close to the timing of the Jazz Singer, and audiences began to clamor for “talkies” rather than silent films. F.W. 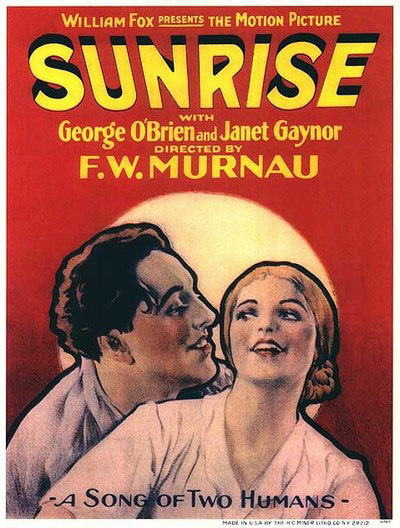 Murnau is one of the greatest directors of film who ever lived and Sunrise is often considered his masterpiece. His cinematic skills allow subtle and simple stories like Sunrise and The Last Laugh, to become great films filled with complexity and originality. Sunrise plays on the undying tensions between city and country, land and sea, marriage and infidelity, among others. His characters rarely have names and Murnau refused to use inter-titles any more than was necessary. Truly, a great film from a great director.